Turkish Model | Hayat Alvi, Ph.D. The recent failed coup d’etat in Turkey has sparked a whirlwind of speculation, conspiracy theories, and anxiety about: who was behind it; the AKP and Fethullah Gulen and his movement’s respective agendas; and the implications of this domestic turmoil for regional and international relations. One thing is clear: in the aftermath of the poorly executed coup President Recep Tayyip Erdogan and his AKP loyalists have gained and wielded tremendous extrajudicial power. Erdogan, in particular, is enjoying a substantial boost in popularity and loyalist support. The fact that all he had to do is verbally request his supporters via the Internet to spill into the streets and fight against the coup plotters is a remarkable illustration of his power. Plus, Erdogan is extremely shrewd in his ability to exploit political Islam, Turkish patriotism, and passionate nationalism by merging all three together. He’s no Qaddafi. Nor is he a Saddam. And he’s definitely not a Morsi. The events of July 15, 2016 and the fallout especially for the secularists and accused “Gulenists” in Turkey have profound implications for the country’s future, the region’s political dynamics and affairs, and even international relations pertaining to Turkey and some of the precedents that these events have generated. Beginning with international politics, these developments illustrate a distressing pattern in the post-Cold War era. That pattern is the desire of some world leaders to follow what I call the “Putin Model” of political autocracy. Increasingly, it seems that a number of heads of state, like Erdogan, seek to achieve political resilience and entrenched power for the long term by replicating some of the methods that Russia’s President Vladimir Putin has utilized. For example, Erdogan served as Prime Minister from 2003 to 2014, and then switched to running in elections for the presidency. Hence, he has been in power in Turkey since 2003. Putin did something similar with the Prime Minister title and then switched to the presidency; he served as Prime Minister from 1999 to 2000, and then President from 2000 to 2008, and then back to Prime Minister from 2008 to 2012; and in 2012 he was reelected as President for a third term, although not without facing allegations of election fraud. However, Putin’s political success in exploiting the titles of Prime Minister and President has been significant, as he was the first to do this in the post-Cold War era, and no doubt many heads of state envy this and wish to replicate it within their own political arenas. Erdogan is one such leader who has succeeded in doing so, and in the process he has secured a powerful support base over the thirteen years he has served in political leadership in Turkey. The country is ideologically divided, mainly between two major fault-lines: Turkish Kemalist secularists, and pro-AKP/Erdogan Islamists. However, when the news broke about the attempted coup in Turkey a few days ago and while events were still unfolding, I was not convinced that the coup would succeed, despite numerous military coups succeeding in the past. Having visited Turkey in 2010 and 2013, I noticed that, although the divisions between the secularists and Islamists are sharp, it’s undeniably clear that Erdogan still enjoys a powerful and loyal support base in many pockets of Istanbul, Ankara, and especially in the more conservative parts of the country, like Konya. Another Putin-modeled move that Erdogan has employed in Turkey is silencing journalists and the media. Putin has blocked numerous online news sources in Russia, he has arrested and harassed journalists, and a number of journalists have even been murdered. Freedom House ranks Russia among the lowest in the world for press freedom. According to Freedom House 2015 world rankings, Russia tied with Ethiopia and Saudi Arabia for number 180, not free, out of #199 (North Korea). Turkey’s rank that year was 142, tied with Malaysia and Pakistan, and also labeled “not free.” In Russia, at least 34 journalists have been murdered since 2000, according to combined data from the Committee to Protect Journalists and Moscow’s Glasnost Defense Foundation (see Linda Qiu, “Does Vladimir Putin Kill Journalists?” PunditFact, January 4, 2016: http://www.politifact.com/punditfact/article/2016/jan/04/does-vladimir-putin-kill-journalists/). Turkey has one of the world’s worst records for jailing journalists. According to the Economist (“Turkey is Sending its Journalists to Prison,” May 10, 2016), “These are dark days for journalism in Turkey. The latest press freedom index by Reporters Without Borders puts the country in 151st place, between Tajikistan and the Democratic Republic of Congo. Censorship is the industry standard. […] Journalists are routinely sacked or dragged through the courts.” Clearly, Erdogan is using the Putin playbook. He is not alone, as a number of Middle Eastern countries are doing the same and using the similar terminology to conveniently label and implicate the media and journalists as co-conspirators with terrorists and/or foreign entities (i.e., mainly Western powers like the United States and others) who are supposedly trying to undermine the state and its leadership. Erdogan’s allegations of the Gulenist movement pulling the strings in the attempted coup manifest this tendency, especially when he pointedly said in his post-coup speech that, “This is not a country that can be run from Pennsylvania,” referring to Fethullah Gulen’s residence in exile in the Poconos. Egypt’s dictator General Abdel Fattah El Sisi routinely demonizes the media and journalists, and countless bloggers and journalists continue to languish in Egyptian prisons. Mona Eltahawy’s New York Times oped (November 23, 2015, “Sisi’s War on Reporters”) provides details about how the Sisi regime “has thrown thousands of people from across the political spectrum into jail. And it knows that the mere suggestion that someone belongs to the Muslim Brotherhood — regardless of any evidence — means a loss of public sympathy.” Egypt has imprisoned an estimated 40,000 political prisoners. She goes on to report that, “With a regime as paranoid and brittle as this, it is not hard to anticipate its actions. A recent Sunday this month was typical: An investigative journalist was detained and interrogated by military prosecutors, a businessman and his son were arrested, and a TV anchorwoman was suspended from her job. […] According to the Arabic Network for Human Rights Information, there are 62 media workers in Mr. Sisi’s jails.” Once again, we see a regional dictator using the Putin playbook. 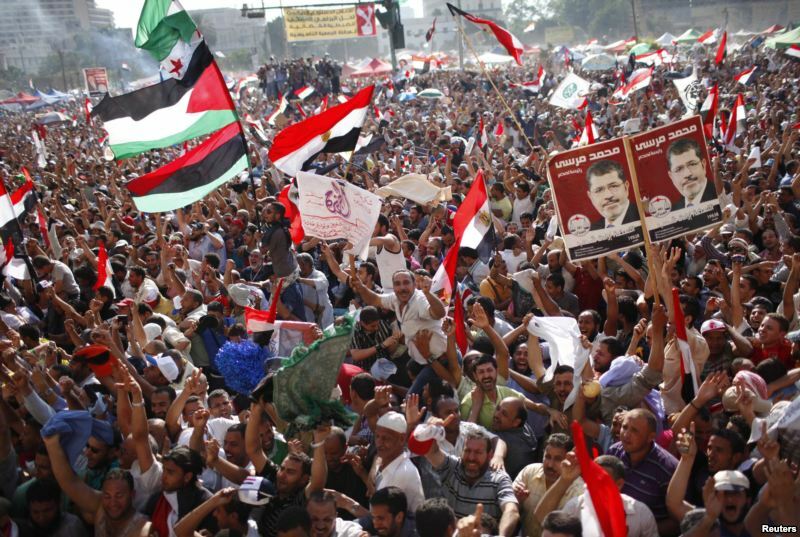 What is very interesting about the two cases – Turkey and Egypt – is that, since the 2011 “Arab Spring” uprisings and revolutions, and the military coup in Egypt that brought Sisi to power in summer 2014, Erdogan and Sisi have been enemies. Sisi has viewed Erdogan as a Muslim Brotherhood supporter, and since the latter supported the Islamist President Mohammed Morsi, who Sisi ousted and imprisoned, there is truth in this allegation. The fantastic irony here is that both Sisi and Erdogan are using the Putin playbook domestically. And, since Erdogan has not only survived the coup attempt at home, but he has in fact consolidated his power and is in the process of purging the government, military, judiciary, and any other entity that he deems suspicious, of his enemies – perceived and real – Egypt’s Sisi has no choice but to accept that Turkey’s Islamists have won the day, and, that too, with help from secularists! When President Morsi won the Egyptian election after the 2011 Arab Spring revolution, many Islamists in Egypt and elsewhere suggested that Egypt, under Islamist rule, could adopt the “Turkish Model,” that is, a political system that harmonizes Islam with democracy as Turkey under Erdogan purports to achieve. That has now changed to the “Putin Model,” in both Turkey and Egypt, although with different ideologies inspiring their respective political systems. But, Turkish democracy, even symbolically, remains a sacred variable. This is illustrated in how both pro-Erdoganists and pro-secularists have collectively crushed the coup attempt. This is in contrast to Egypt, which has never tasted democracy in its entire history. Erdogan’s domestic, regional, and international strategies have been curious and interesting. First, upon coming to power, the AKP cut off the legs of the powerful military, arresting the top ten percent of high-ranking officers in the context of various coup-suspected scandals. This includes the “Ergenekon” case and the “Sledgehammer” conspiracy; however, Turkey’s appeals courts just recently overturned hundreds of convictions pertaining to both. Second, Erdogan just achieved rapprochement with Israel and Russia, and he was in the process of renewing ties with the Syrian government. With an estimated 2.7 million registered Syrian refugees in Turkey (as of June 2016, according to the UNHCR), Erdogan is in an extremely tough jam. The once thriving economy is struggling, and the influx of Syrian refugees, the increase in terrorist attacks inside Turkey by various terrorist groups including ISIS, the PKK, and others, and the plummeting tourism industry are all negatively affecting Turkey’s economic health. Surely, the Turkish people are eager to see Turkey return to days of peace, economic progress, and security. At the regional and international levels, a number of countries and organizations will need to view Turkey through different lenses now, and what they see might not be very palatable to them. NATO and Europe will need to get used to political Islam (also called Islamism) at their doorstep. This is distinctly different from Islamic terrorism. Here, I am referring to a political system that is based on Islamic principles and laws, which is perhaps what Erdogan and the AKP are striving for in post-coup Turkey. Given the coup’s failure, they are likely closer to achieving this than in the past. The United States, in particular, will need to deal with this new reality in Turkey, and simultaneously it will need to devise an effective strategy to handle the Fethullah Gulen dilemma, as well as the integrity and security of the Incirlik military base. Gulen has not exactly been an asset to the United States. Following the failed coup in Turkey, the Incirlik base plunged into chaos, and the authorities cut its power and simultaneously demanded that the U.S. extradite Gulen to Turkey. U.S.-led anti-ISIS air strike operations from Incirlik came to a halt. The United States cannot afford to be caught in such a “catch-22” situation, especially with so much at stake concerning the Incirlik base and its operations. Dealing with these issues, and especially Incirlik, must be wisely strategized as soon as possible. With ISIS cells scattered throughout Turkey, and still very active, along with Al Qaeda, in Syria next door, there is no room for error or lax preparations regarding this matter. This must be a top priority for U.S. policy makers and strategists. Also, effective U.S.-Turkish diplomacy is crucial, especially now that Erdogan has made amends with Putin and is reaching out to the Assad regime as well. These days we certainly cannot envy the Turkish people, as they are faced with stark realities, limited choices, and seemingly perpetual uncertainties and anxieties. However, there’s a chance that Erdogan will surprise us by formulating a new “Turkish model” of Turkish Islamic democracy. Whether the world will respect or revile the new model will be up to Erdogan’s decisions and actions in the coming weeks and months. For now, the world is watching, while Erdogan takes his gloves off in the domestic arena. On the one hand, who can blame him? On the other hand, he’s the one to blame.